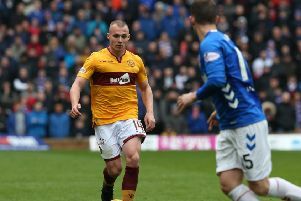 Motherwell goalkeeper Mark Gillespie has admitted that the manner of Saturday's 2-1 home defeat by Ross County defeat was “concerning” but insisted that Motherwell can bounce back from their cup disappointment in the home league game against Hibernian tonight (Wednesday). Gillespie added: “Football moves quickly and we’ve got Wednesday to kickstart the second half of our league campaign so that’s the only thing we can do. “We can close the gap against Hibs. “We know we’ve got good players and that we can pick results up. “You just need to go back to those games, Aberdeen at home, Celtic and Rangers at home where we picked up points. “We’ve got to lift ourselves to those levels more consistently. Gillespie insisted that new loan signing Ross McCormack – substituted at half-time against County due to an obvious lack of match sharpness – can come good in the remaining league games this season. “Of course Ross can make a difference,” the keeper added. “He’s been out for a while with his injuries. He is ahead of schedule. “It was great to see him in the starting 11. He’ll take time to bed into the team but he’s a massive player for us and someone who can get the fans off their seats.